Our annual One Church Ministries Conference USA is an important time for Living Light Christian Churches. It’s not just a wonderful time to celebrate the amazing covenant life we have in Christ, but it is also when we are instructed and commissioned for the next leg of our journey together as a family of churches. As always, we come first to worship our Lord Jesus Christ with all of our hearts, to proclaim His goodness, and experience His wonderful presence. Year after year, we have been privileged to have God speak to us, direct us, and inspire us in both the prophetic and preached word. 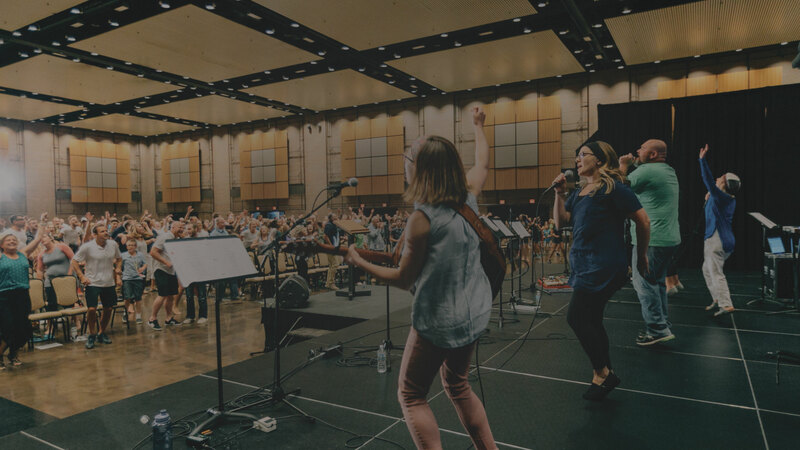 We are excited to hold our 2019 conference at the Century Center in South Bend, Indiana. *The DoubleTree website may show the standard rate of $15/day, but that does not reflect our special group rate. The special room rate will be available until June 12th or until the group block is sold-out, whichever comes first. Call or use the group link below. The special room rate will be available until June 12th or until the group block is sold-out, whichever comes first. For ages 0-2, classes will be provided and staffed by volunteers during all meetings (worship & teaching). Children entering preschool to 5th Grade are in the main session for the worship time and then go to their own classes for the teaching time. If you are not staying at one of the hotels connected to the conference you can park at the Century Center for a discounted rate of $5/day. You can also park in the Main & Colfax Garage in Downtown South Bend. Rates for Mon – Fri are: 2 hour free parking; $10/day; free after 5:00 p.m. Parking is free all day on weekends, excluding special events. See all downtown parking options here. Download these maps so you can navigate your way around the convention center. See all the things to do in South Bend at visitsouthbend.com. Mishawaka, the Princess City, lies nestled along the meandering path of the St. Joseph River. Explore the beautiful downtown and the surrounding neighborhoods and find unique boutiques, excellent dining options, and beautiful riverfront parks and pathways. Watch interactive light sculptures on both sides of the river. Best places to watch the River Lights is from Seitz Park, Colfax Bridge, Island Park, and Pier Park. River Lights turn on thirty minutes before sunset and stay on until sunrise. There will be organized sports at one of the area parks (TBD) on Saturday from 2-4pm. Sports could include Ultimate, Football, and Soccer. No need to sign up, just show up to play! There are 13 museums in South Bend, including the South Bend Chocolate Factory and Museum, Hannah Lindahl Children’s Museum, Heathworks! Kids’ Museum, South Bend Museum of Art, and more! There are many area parks to explore for hiking, swimming, playgrounds, and more. See the full list here. This community center has no shortage of fun ways to spend your day! Climb the rock wall, play in the gymnasium, float down the lazy river, or travel down the winding water slide. Day passes are available. Check out the Chicago Cubs minor league team – South Bend Cubs – while you’re in town! Kids can climb on the playground, cool off on the splash pad, bounce and slide in the inflatable Fun Zone, or practice your home-run swing in the new state-of-the-art Performance Center. Prepare to get wet! Enjoy white water rafting and kayaking in downtown South Bend on the East Race Waterway in Niles Avenue. The course is 1,900 feet long and is for both beginners and advanced rafters. Required height for rafting is 54”. Children under the age of 16 must be accompanied by an adult in the raft. Reserve your spot at the OCM Conference by April 30 and use discount code EARLYBIRD to save $15. Single adults 18 and older must register themselves as an adult, even if they still live with their parents. If you would like to pay by cash or check, you can select that as a payment option through the event registration page, or contact the church office for assistance. Be sure to make checks payable to One Church Ministries.